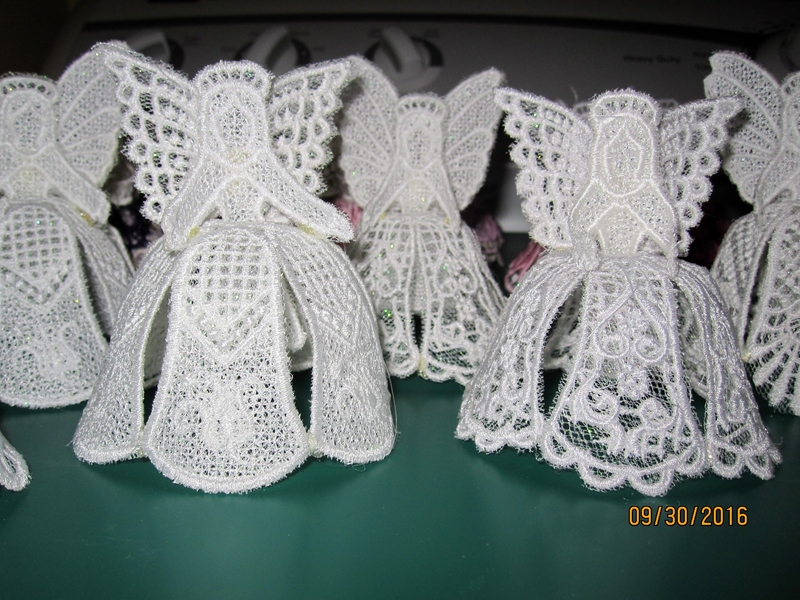 A host of heavenly angels, 25 in all Two different styles, photo 2 are bell skirts and photo 3 are original skirts. I think I have done enough FSL for now. Beautiful job! love all the different colors and skirts.! Wow! A blast from the past. (2016) I sold some of these at a craft show, gave a few as gifts and put some on my tree. I love to watch fsl stitch out. Now, that was a huge time commitment! Did you make these for a special occassion? They sure are lovely! Wow, you have done a great job! Good day. How do I download this design? I'm looking for a 3D nativity scene buy so far had no luck. Can only find angels, x'mas trees and lanterns. Can you help please. I found the on SD, and a few other things too. Can't wait to make them for my GDs. 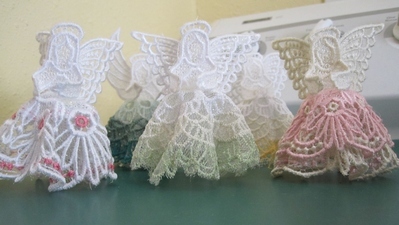 Are the angels in the 3rd picture (with floral skirts) from stitch delight also? I've looked and cannot find them. I would love to buy that design. They are beautiful. You do lovely work. What lovely LACE you have created - I never tire of FSL. 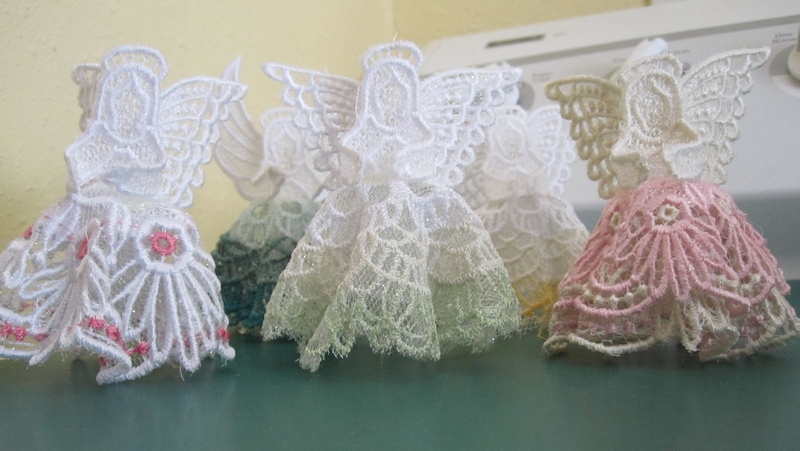 Your angels are beautiful, everyone will enjoy! Very pretty, some people are going to very lucky to receive these. What a heavenly group! I admire your patience in stitching these all out. Are you giving them as gifts to special people? Or, perhaps decorating a mantle? Many many many hours here. Beautiful!! Wow! Beautiful! And what a lot of work! Very nice work. You must be really pleased with this result. All are lovely, but love the ones with the hint of colour. please, please. what designs are those. 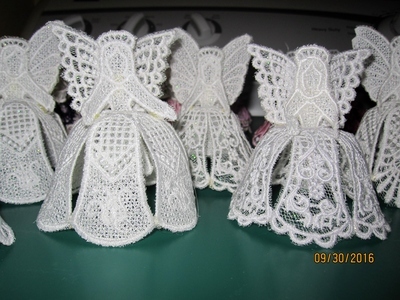 did the bell skirts come with the angels? They were recently on sale for 1 dollar each but I see they have gone back to full price. Stitch Delight is having a half off of everything sale until Dec 31. Good time to get these angels. Yours are so beautiful. These are spectacular! I just know the number of hours you've put in to these and what beauties they are. Beautiful, where can we purchase these designs please. I can see Christmas trees around the world decorated with Angels this year. W U N D E R S C H Ö N - verraten Sie , woher di Designs sind????? Those are gorgeous! Where did you get the designs? I have never done FSL but I would love to give these a try for Christmas. Wow, they are spectacular, love them all but especially those showing some colour! Congratulations! What a wonderful job and I admire that little touch of the colour variations on several of the pieces. This is another picture not to show my good lady..............................the list of jobs from her for Christmas has already grown to epic proportions! Sjoe!!! !All so Very pretty!!! !Stunning selection!!! !Whose designs are they from????Beautiful!!! you have been very busy, great job. Beautiful! I really love the small bits of color. A stunning collection you have made, well done. They are ALL fantastic. Sandra. 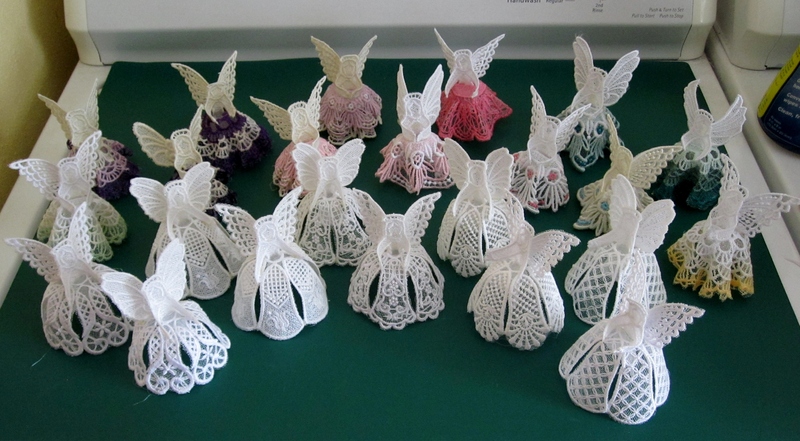 This is a wonderful collection of angels. Well done. 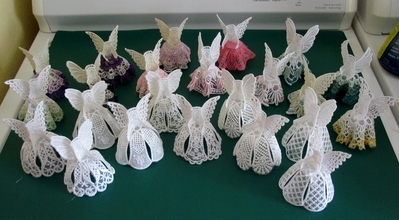 Truly a gorgeous collection of angels. Well done! Beautiful.. Love all of them. beautiful. I wonder what you will do next to top this. Wher du you get the design? WOW ! They are all just Beautiful !!! Gorgeous!!! where can one find the designs?